"Even the Sky is Not the Limit..." Maxima is a mere self-restriction. Everytime we reach the maxima, it should get higher! I help Organizations to increase this Maxima continuously by switching to Agile Lean way of working. 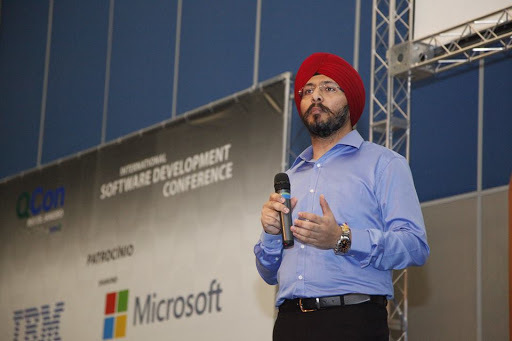 I have 10+ years of experience in leading & coaching Agile teams working in in India, US, Europe, Argentina,etc. Currently, I am working with a Multinational Organization in Ireland as an Agile Consultant. I am a passionate Blogger and many of my blogs are published at Scrum Alliance's website. If you have any challenging assignment for me, please drop an email: gp.singh.tech@gmail.com or call me at +353-899-513-124. The retrospective is one of the most powerful Agile ceremonies. They require you to learn from your experiences and challenge you to continuously improve. In this interactive session, you’ll explore retrospectives in depth, including activities to bring out different personality types and patterns for different levels of team maturity. Scrum has gifted a few Scrum Ceremonies to the world: Sprint Planning, Daily Standups, Backlog Grooming and the Sprint Retrospective. The Retrospective is one of the most important and the most powerful Ceremony. Retrospectives are required to learn from the experience and improve upon. To he ever-growing competition, the Organizations need to learn a lot from their experience and change accordingly (Charles Darwin: Survival of the fittest). If it is performed well, it can yield wonderful outcomes to improve anything/everything. Over a period of time, the teams start feeling bored about the same Old Retrospective (Glad, Sad or Mad, etc) so a lot of Fun/engagement part needs to be added to the same. In the current times, Retrospectives need a rebirth otherwise Retrospectives will die and the Learning curve will die as well! Culture is the most widely talked in societies, religion, race, region and workplaces as well. Organizations are the Second Homes as people spend their better half of their time in their offices. Hence, Culture is an integral part (good or bad) for driving the happiness of clients and the colleagues, and success for the products/projects and growing / sustaining business. Agile Implementation is highly dependent upon the Culture of the Organization. How does a Manager transition to the Role of a Product Owner? What happens to a Product Owner who wants to retain his control on the team rather than working on the Product? Some developers think that Scrum, for instance, brings a lot of meetings and these meetings are a waste of time. The Scrum Master’s role is not a full time role in many companies. Leadership thinks Agile can solve most of their issues without even knowing the root causes of the issues. Come to this talk and we will discuss a selection of real-life experiences to tackle these cultural issues and the actual/suggestive steps taken to improve the culture of organizations. The transition of Waterfall to Agile methodologies is never easy. The Waterfall approach consisted of these documents as a way to analyze the User needs: BRD (Business Requirement Documents), FRSs (Functional Requirement Specifications), SRS (Software Requirement Specifications), PRDs (Product Requirement Documents), etc. After the initial agreements, the development starts. In Scrum, the most important artifact to map User needs is the User Story. However, sometimes, the User Story is too big or too small or too abstract or never ending. This often lands the teams in difficult situations. So, it is very crucial to Identify the Ideal Bite Size -- to identify the ideal size of our User Stories, yet keeping these Effective! The transition of Waterfall to Agile methodologies is never easy. The Waterfall approach consisted of these documents as a way to analyze the User needs: BRD (Business Requirement Documents), FRSs (Functional Requirement Specifications), SRS (Software Requirement Specifications), PRDs (Product Requirement Documents), etc. After the initial agreements, the development starts. In Scrum, the most important artifact to map User needs is the User Story. However, sometimes, the User Story is too big or too small or too abstract or never ending. This often lands the teams in difficult situations. So, it is vey crucial to Identify the Ideal Bite Size -- to identify the ideal size of our User Stories, yet keeping these Effective! Every Company is trying to surpass its Competitors in this ever changing World. Today, World is changing so fast, that every company needs to Iterate faster after reading the Customers’ insights. The transition happened from the Industrial Age to the Waterfall Age. The Waterfall resolved the concerns to an extent; however, it laid the foundation for a new set of issues. Then the focus shifted to RUP, Spiral, V models and finally to Scrum, XP, Lean, Kanban, Scaling Agile, etc. However, no framework or methodology can solve the concerns without having a Good Engineering Culture. The Culture undoubtedly consists of People and the surrounding Processes & Practices to help them (& not act as Blockers) to achieve the ever changing Definition of Success. In this context, this talk will emphasize to shift our focus from the Leadership-Powerpoint Slides to our Engineering Culture. It will highlight the Problems and an attempt to answer the same by taking good case studies of Companies like Spotify, 3M, etc. We will talk about philosophies like M3.0, Holocracy, Tribal Leadership, etc and Engineering practices like Pair Programming, Continuous Integration, etc. We will also focus on the Roles of PO, SM, Developers, UX and the Leadership to shift to better Engineering Culture for the overall success of the Employees, Teams, Products and the Company on the whole. Ina a nutshell, this talk underlines the importance of Alignment of Leadership’s Vision with Actual-on-the-ground Engineering Culture to achieve a Win-Win situation.